With users in the tens of millions, Vine is a very active social media platform. Like with any platform that gets that much use from people, it has drawn in a number of brands that are eager to get a piece. 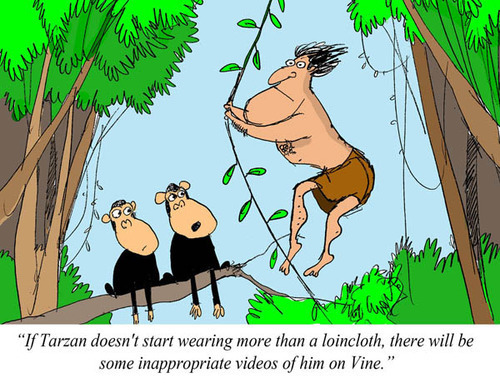 A Vine is a very different beast than a YouTube video. For businesses looking to take advantage of it, you need to be able to tell stories or give tips/advice extremely quickly. I won’t make the Instagram Video vs. Vine debate, instead I’m sharing these case studies of businesses on Vine for your own inspiration. In this article we’ll look at 5 companies that are rocking Vine and how they’re doing it. Lowe’s vines use the #lowesfixinsix hashtag and focuses on creatively demonstrating quick tips or “life hacks” like using foil to clean a grill, quickly drilling holes in a PVC pipe to store screwdrivers and wrapping rubber bands around tools to keep them from sliding off when working on the roof. The above received 480 likes and 10 revines. You can see from the comments section that Lowe’s followers appreciate these #lowesfixinsix tips. User Chris Roe commented “Damn you guys are good. Probably some of the best uses for Vine.” while Anna Akbar-Ali tagged a friend in her comment, stating “omg my life is changed by lowes vines”. This strategy works great for Lowe’s and can be successful for many other retailers and businesses too. No matter the industry, businesses in that industry acquire “tribal knowledge”- which is why customers seek out both product and service-based companies’ expertise. Share what you know with your followers to engender goodwill and build a connection, much like you would do if the customer was in-store. Luckily, you don’t have to worry about sharing too much as vines are only six seconds or less! These teasers give customers a reason to frequent your business. Virgin Mobile’s latest promotion on Vine is a contest that uses the hashtag #happyaccidents. Earlier this year, Virgin Mobile launched an iPhone on no-contract offer with a TV commercial that shows people deliberately breaking their current devices by “accident” to migrate over to Virgin’s promotion. The current Vine contest has users submit vines showing “happy accidents” that occur when someone is addicted to their phone. Creative and funny vines get revined by Virgin Mobile USA and the contest winner will have their Vine featured in Virgin’s next TV commercial. Virgin Mobile USA clearly sees the value that promotion on Vine brings, as they paid influential Vine users to promote the contest upon launch. User @Pinot is one of those hired to promote the contest (hired promoters cannot win) and he has nearly 150,000 followers. His inaugural Vine to launch the contest was posted by Virgin Mobile USA and received 5,646 likes, 651 revines and around 100 comments. Contests on Vine have high involvement due to the ease in creating, uploading and sharing a Vine. This contest is a benchmark but take note that successful contests have been run with a feature on the company’s social media account as the prize or an incentive as low as a $25 gift card to the business. Check out @Pinot’s beautifully illustrated Vine that shows a cell phone being dropped into a ripple of colour that ends with the text “Contest #HappyAccidents”. Since this post Virgin has been active in revining the most creative contest entries. The one below shows user Jamie Lynn tripping over a friend, dropping her phone and running frantically to the phone’s rescue instead of her victim’s. The Vine above was revined by Virgin Mobile USA and has since received 71,735 likes, 19,170 revines and nearly 900 comments. This contest has become incredibly popular on Vine and submissions are constantly pouring in at the moment. In my opinion, Virgin Mobile’s account is so popular because of the amount of follower participation they encourage. In addition to this contest, they also feature guest ‘Viners’, frequently revine content from followers and actively respond to comments. Any customer-service based business should look to Virgin Mobile for Vine-spo. The Coffee Bean has recruited Vine user/Art Director Jethro Ames to create their #howto Vines. I love these Vines because they are both visually interesting and informative. The latest features an assembly line of espresso shots, ingredients and a blender alongside recipe cards with names and measurements titled “#howto Create the Original Ice Blended. #Vine by Jethro Ames”. My personal favourite shows a to-go Coffee Bean cup travelling from different coffee-growing regions and ending on the counter at The Coffee Bean. Not as informative as the other two posts but it is both endearing and an appealing visual. This Vine was posted June 6, is captioned “#howto Seek quality Coffee & Tea, wherever it grows. #Vine by Jethro Ames #favthings” and received 161 likes with some very positive feedback from followers via the comments. The Coffee Bean has taken a product as ubiquitous as Coffee and Tea and made it interesting and personal for their followers. Not everyone is an animation expert, but Vine makes it very easy for users to look like they are. If you put some thought into the premise of each Vine, add value for your followers with information, humour or nostalgia, etc and make each Vine look interesting visually, the level of success you find with Vine in terms of engagement and increasing brand appeal will increase dramatically. Trust that customers can tell which companies are really putting thought into what content they will like and which companies are simply going through the motions. Not every Vine will look like a visual masterpiece and it doesn’t need to- but put time and effort into thinking out the concept because that’s what will count in the end. ASOS is the definition of an early adopter of Vine. Their first Vine was posted on January 28 just four days after Twitter launched Vine. They keep their account super active with a huge variety of posts. One of my personal favs from their profile demonstrates what happens when you put Asos Denim inside a blender. It uses the hashtag #denimchallenge and is captioned “We took on @gagakelvin’s #denimchallenge. Its safe to fall into a blender in #asosdenim. It doesn’t blend! Challenge completed.” Posted on April 26, It received 46 likes. ASOS keeps their contest fresh with posting Vines from behind the scenes of photo shoots, happenings in their office, at fashion industry events and more. People love to get an ‘exclusive sneak peek’ and Vine shows just enough to create interest without tempering enthusiasm for a new product launch or website post. Use Vine to create teaser videos for upcoming promotions, blog posts and product launches. Followers will fawn for something as simple as a “Hey, we love you guys!” from your company (have staff participate) dedicated to your Vine followers. Short posts mean you can post more often so use Vine frequently. ASOS gets a lot of engagement from followers with their ongoing #ASOSUnbox promotion, where they ask followers to post Vines showing them opening their ASOS orders, to tag it using the hashtag #ASOSUnbox and they will be entered to win a prize. They run other contests as well and post Vines of the winners showing off their prizes. If you are a retailer, I recommend that you run a similar promotion. Even a service based business can offer 5% off to customers who Vine their experience. This is a really good way to show off your product to new customers and to keep content coming in on your Vine account. User participation is always the best Social Media strategy. Samsung’s Vines feature a ‘Vineception’ theme, all featuring the Samsung Galaxy phone with the hashtag #GalaxyVine. The Vines all feature an element of “a Vine inside a Vine” such as the first one, shown below, that shows three Samsung Galaxy devices, all running the same Vine concurrently that continues to be worked on on all three phones, so the Vine shows a creation of a Vine. Their second Vine goes next level by showing the creation of the original Vine that demonstrated the creation of an animated Vine on a Samsung Galaxy. This Vine is captioned “Our #GalaxyVine of our #GalaxyVine. Meta.” Another Vine posted on June 18th is an animation of a basketball player shooting into a hoop, that streams continuously from one Samsung device to another (tablets included). These Vines are a really excellent demonstration of the capability of Samsung’s devices and the creativeness of their Marketing and Design team. Their last three Vines combine 3D settings (props, etc) with Vines running on Samsung devices for a very cool looking promo. When the advertising is amusing, people will want to look at it. This post is topical as it was posted the same day as the anniversary of the first man on the moon. When companies tie-in fun promotions to their advertising, it always looks good and makes the advert more memorable. I really enjoy Samsung’s Vines and they make Vine on the Galaxy actually look easy (No, I’m not being coerced into saying that!). Like most people, when advertising shows me something cool, I want to see more and so I’ll be staying tuned to Samsung’s page. I was really skeptical of Vine at first, but after doing the research for this article I am sold. These companies are doing really creative and fun things with the Vine app and followers are responding. I found myself enjoying the animations and even liking some of the posts. Vine has become a part of the Social Media conversation, and I look forward to seeing how more companies enter the discussion. Do you use Vine? Do you like it? Why/why not? If your business is not on Vine yet, are you considering it? Let me know in the comments if you found these examples useful or if you have your own to share!